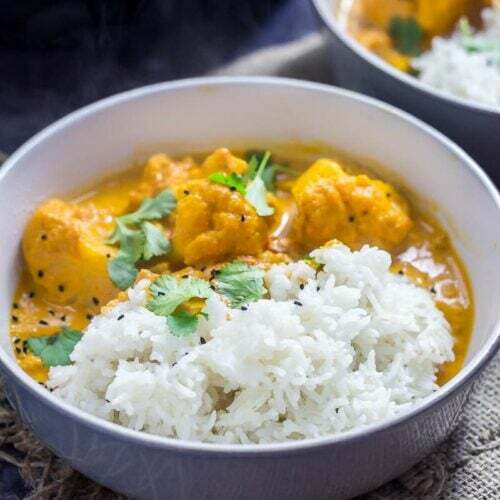 This creamy cauliflower curry has an amazing butter chicken style sauce but switches out the meat for a great vegetarian meal. You can make it in the pressure cooker or Instant Pot in a matter of minutes! We are so into the pressure cooker. 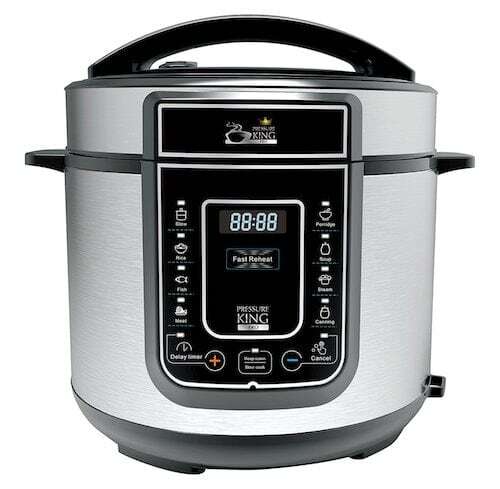 Around Christmas I was desperate for an Instant Pot but they were sold out in basically the whole country so Will got me a Pressure King Pro instead and we’ve been making plenty of recipes in it. If you’ve got one too then make sure you grab all my favourite pressure king pro recipes! Without really planning it we’ve ended up making several curries in it including a pressure cooker curry with potato and aubergine and pressure cooker saag aloo. They’re both cooked in a ridiculously short amount of time and the pressure cooker locks in all that amazing curry flavour! 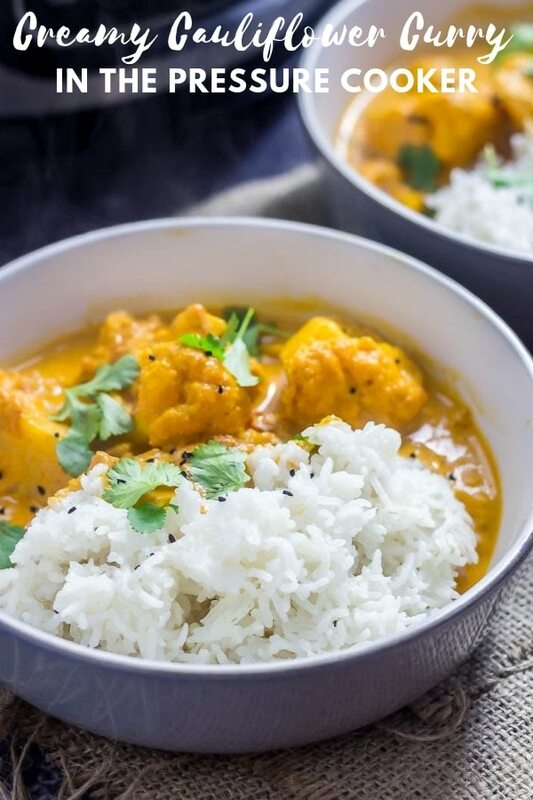 Click here to pin this recipe for creamy cauliflower curry for later! So let’s talk about butter chicken (chicken makhani) for a minute. 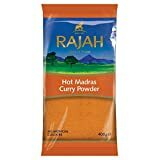 It’s my all time favourite curry to order when we go out for Indian food. It’s so creamy and comforting. I originally had butter chicken at a curry restaurant near my parent’s house and theirs is still probably my favourite version. With this recipe I wanted to get the flavours of butter chicken but keep it vegetarian. Of course it’s not authentic but I promise it tastes really good! 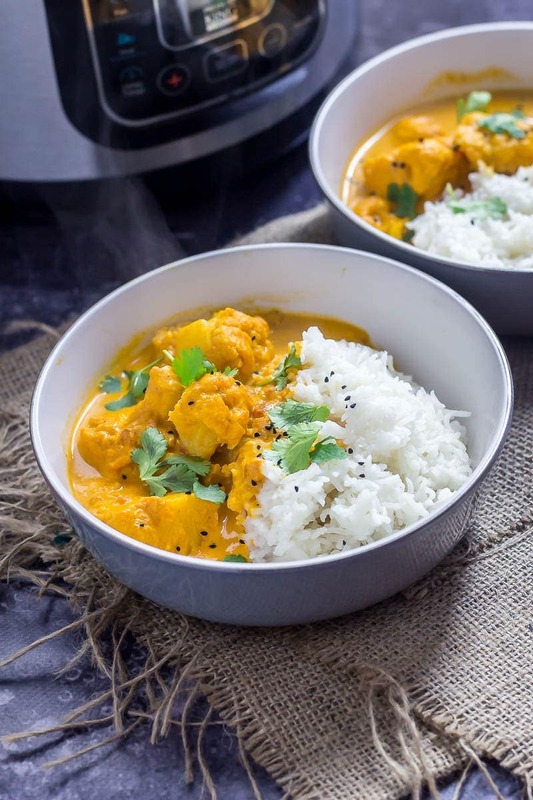 WHAT’S SO GOOD ABOUT THIS CREAMY CAULIFLOWER CURRY RECIPE? 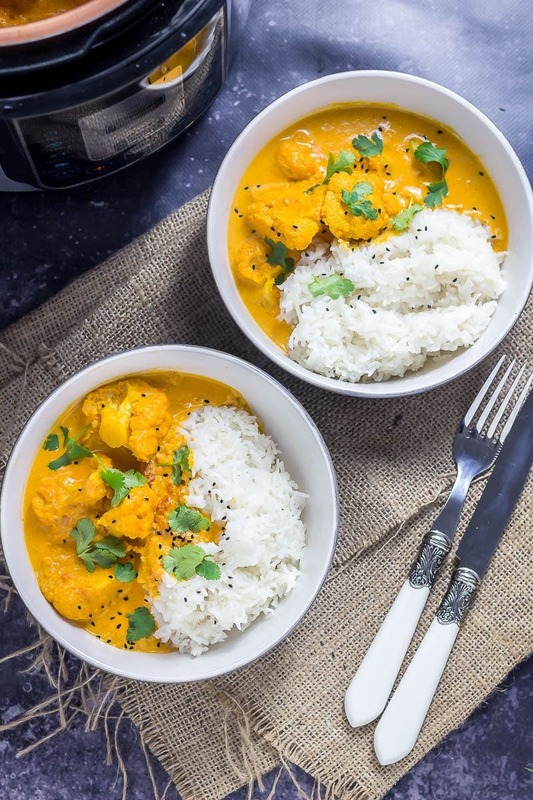 Ok, so first off, it uses a classic butter chicken style sauce recipe which has butter as a base (and therefore is obviously a winner) followed by plenty of seasoning and flavour and is finished off with a hearty helping of double cream. Secondly, cauliflower is almost as good as chicken would be in this curry. I mean it, it’s a delicious chicken alternative and, bonus, it’s good for you! 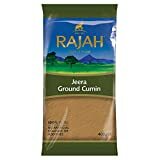 Finally, it’s made in the pressure cooker so it’s just 3 minutes until you’ve got curry ready to go. So butter chicken always reminds me of being at home and going out for curry with my parents >>> two of my favourite things. I still eat butter chicken on a pretty regular basis since curry is one of my favourite things to get as take away. That and a little saag aloo is pretty much my dream night in. I’ve tried making butter chicken a couple of times and this sauce is just something else. Ultimate comfort food. I really love that this recipe is so similar to butter chicken but it’s vegetarian. 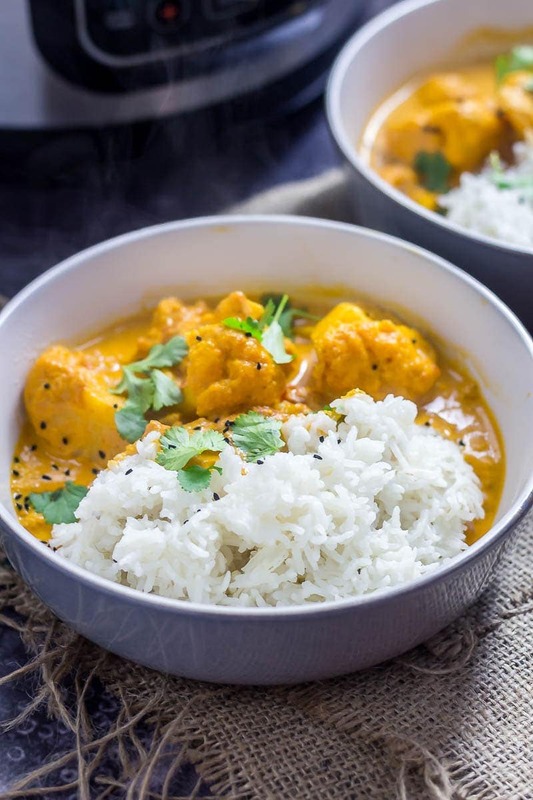 The cauliflower in this curry is cooked for just the right amount of time that it retains a little bite while still being cooked through and a bit creamy. 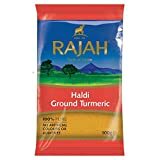 It’s coated in all that creamy curry sauce and tastes amazing served with basmati rice, nigella seeds and coriander (cilantro) leaves. 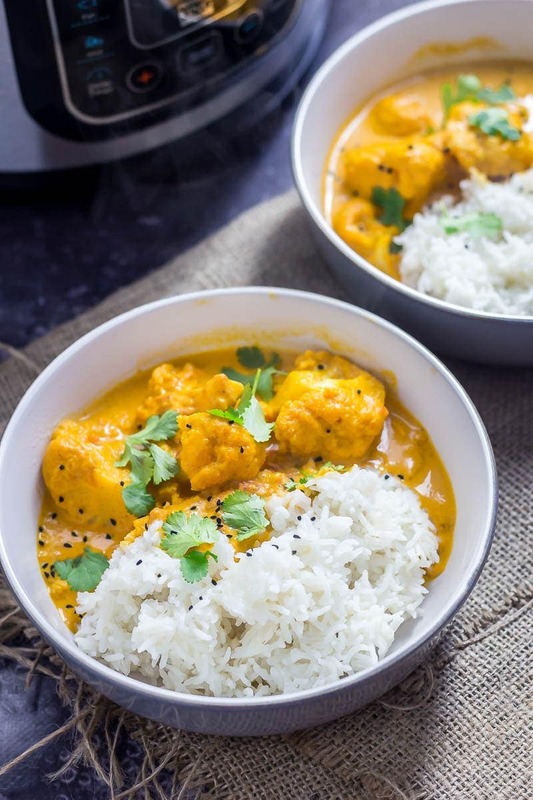 It’s honestly the best cauliflower curry! Another thing about this recipe? Will and I pretty much always cook double portions of dinner because we need lunches for the next day. 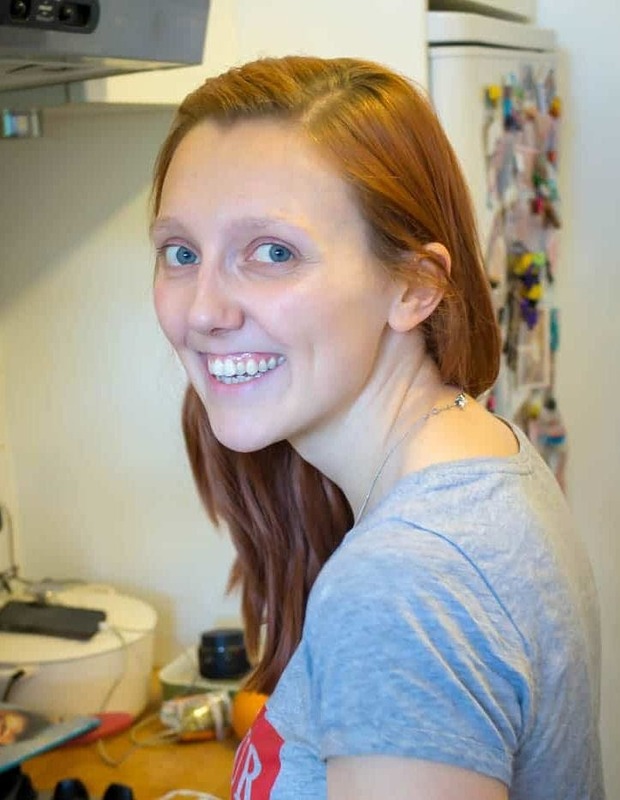 I cannot be doing with London lunchtime prices, you can easily spend well over a fiver everyday on lunch and that just seems like such a waste when I can cook something better at home! Curry usually makes amazing leftovers because all those spices just develop more and more the longer you leave it. Making for some pretty excellent lunchtimes. It’s a good idea to take a look at your pressure cooker manual to see how long to cook this for. In my pressure cooker it took 3 minutes to cook the cauliflower perfectly but yours might differ slightly. I’ve got really into using garlic and ginger pastes recently. They really cut down on prep time so give them a go in this recipe if you’re short on time. So easy! Once you’ve released the pressure and added the cream I like to turn the saute setting back on for a minute to heat it through before serving. 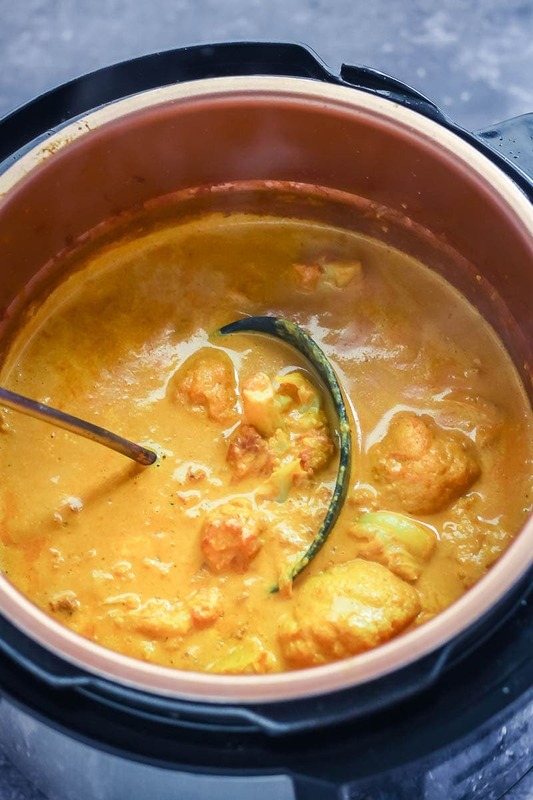 CAN YOU MAKE THIS CAULIFLOWER CURRY RECIPE ON THE HOB/STOVETOP? Definitely! Just follow the steps but cook in a big pot over a medium heat. Add 200-300ml of water (about a cup) and cook until the cauliflower is tender. Once it’s finished cooking add the cream as stated in the instructions then heat through for another minute before serving. 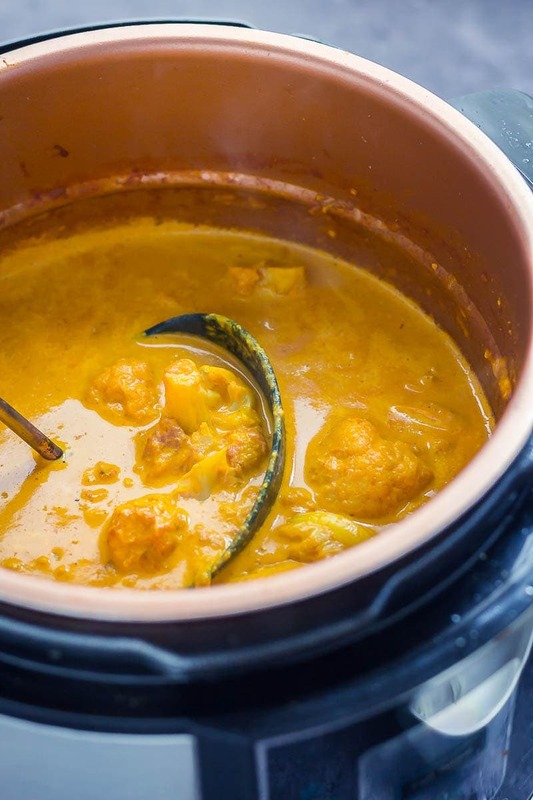 CAN YOU MAKE THIS CAULIFLOWER CURRY IN THE SLOW COOKER? Add all of the ingredients up until the cauliflower to your slow cooker then pour over 200ml (0.8 cups) of water and cook on medium for 4 hours. Add the cream and cook for another 15 minutes. 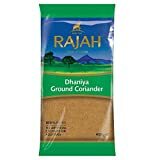 Can you freeze cauliflower curry? This curry freezes really well. We’ve made a few batches and frozen it for quick lunches and dinners throughout the week. When you’re ready to eat just defrost thoroughly and pop in the microwave until heated through. Put your pressure cooker on the saute setting. Add the butter and let it melt then add the onion, garlic and ginger and cook for a couple of minutes. Add the tomato puree, all of the spices and the salt and stir to coat. 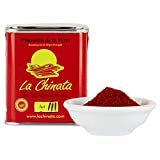 Cook for a minutes until the spices become super aromatic then pour in the chopped tomatoes, add the cauliflower florets and add enough water to reach the minimum line in your pressure cooker. Cook on the stew setting for 3 minutes. Release the pressure then add the cream to the pot and put the saute setting back on for a minute to make sure it's hot. Serve with rice and topped with fresh coriander leaves and nigella seeds. wow! 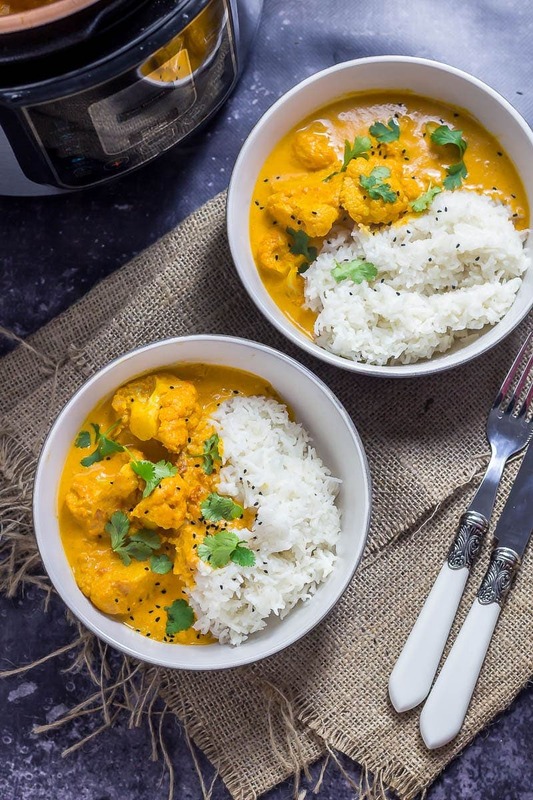 cauliflower curry looks so delicious and creamy! Okay, now you’ve totally got me craving some curry! Love how easy this is to make! Curried cauliflower is so delicious, and such a great combination. Making it in the pressure cooker is quick and easy, ideal for a tasty mid-weel meal. This is the most awesome recipe. I love it. And I can’t believe how quick it is in the pressure cooker. Def gotta try! I don’t have an Instant Pot, but I do have a regular pressure cooker. 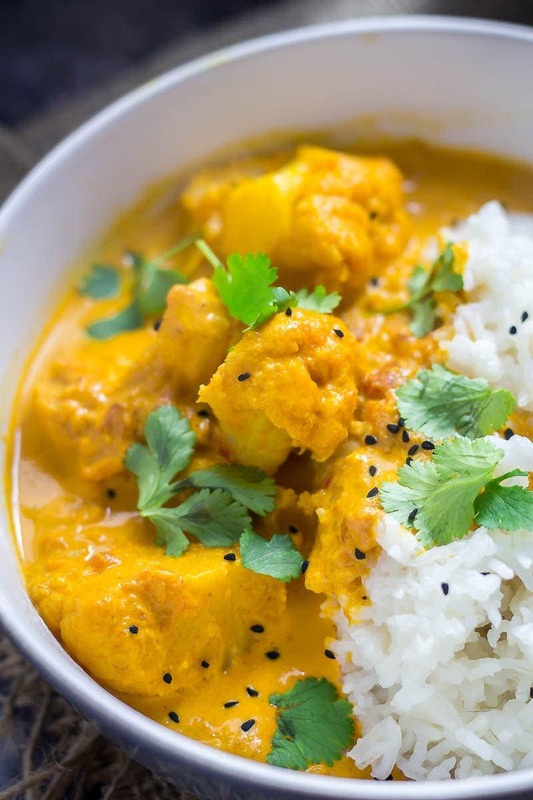 I love all kinds of curries…and cauliflower is a great ingredient for sure. This looks like a flavourful and satisfying dish for sure. I made this absolute delicious recipe many times! Totally love it. Janine this makes me so happy, thank you so much for commenting! 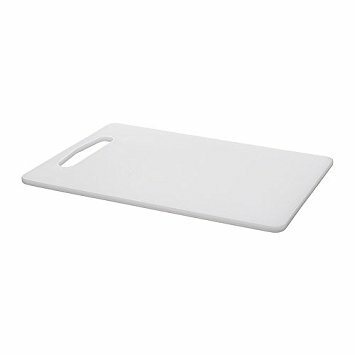 I don’t see onion in the list of ingredients, how much should I use? I’m guessing just one. Thanks.